Pot Limit Omaha | PLO Killed the NLH Star - Play Pot Limit Omaha! Move over Texas Hold’em, Pot Limit Omaha is the new “it” game. Any of those that have played Hold’em since the Poker Boom days of old know how much No Limit Texas Hold’em, and the game in its other forms has contributed to the rise of the poker. An entire industry, online poker (and perhaps online gambling), would never be around today if Texas Hold’em didn’t explode in popularity in the early 2000s. However, those days, are long gone. Texas Hold’em players that are frustrated with their win rates online and playing live, both in cash games and tournaments, need to look at the sobering reality of today’s game. Yes, since the Black Friday seizures of PokerStars and Full Tilt Poker occurred in April 2011, things have been going downhill for online poker, and live cardrooms, and more specifically, No Limit Hold’em. We’ve seen rake rise online and offline and the attractive VIP deals and rakeback deals of old have gotten worse or stayed static. Oh, and not only have the rake and the deals gotten worse, but the game quality has gotten tougher. There are far fewer players playing the game than there were five years ago. For the most part, the sharks are cutting into each other’s win rates, and the fish that were once consistently contributing to the poker ecosystem have already busted out. A portion of them has also gotten better. For those of who are playing online, this is apparent. The Texas Hold’em market online has gotten far more efficient. Those of you who play recreationally or even semi-professionally at brick n’ mortar poker rooms, take a look at the games you played years ago compared to today. Not only are there fewer people playing poker, but they’re far better. The games are no longer loose and action-filled in many cases. Weekends are still usually still good at live cardrooms but try going there during the week. There aren’t many games, and No Limit Texas Hold’em games are way tighter than ever before. As a former poker pro, Texas Hold’em is no longer the game I loved when I was a professional player. Yeah, the games are tougher, but it’s also just not the same vibe. No one is having fun at the table anymore. Table etiquette is at an all-time low. Instead of people laughing off bad beats – choice words are exchanged. People are angrier. Everyone is telling everyone else how to play. Remember, even if you’re there to solely make money at a poker game, whether live or online, most people are there just to have fun. Today, just about everyone seems to forget that. You don’t have to be a robot. You can interact with other players. If you’re playing online and multi-tabling, of course, this is a different story, but there is zero reason to berate fish or tell someone how to play in the chat. The fun vibe of a poker table, people, laughing about hands, playing loose, having some drinks – it seems almost gone to me. That is when it comes to playing Texas Hold’em. There is a game that offers a softer field of players and is more fun to play, that’s Pot Limit Omaha (PLO). PLO still isn’t as popular as Texas Hold’em, but this game is easily the most popular game behind No Limit Texas Hold’em. 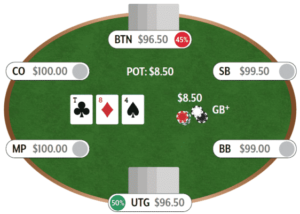 The main reason to play Pot Limit Omaha is that it’s simply the less efficient game. The worst Hold’em players aren’t playing anymore – they’re broke. They’ve been beaten down for a decade and are broke and can’t afford it anymore. Also, you’ll notice a big difference when playing in Pot Limit Omaha games compared to No Limit Texas Hold’em. The vibe is a lot more fun. It reminds me of playing poker ten years ago. Everyone is splashing chips around and having a good time. Aside from all that, the games are softer. 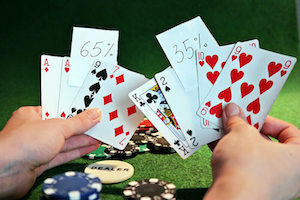 Playing four cards draws more gamblers in, and some of them never want to go back to playing “boring two-card” poker. There are so many skilled poker players out there that continue to play No Limit Texas Hold’em in poor games and grind out awful win rates. Part of being a poker player and a +EV gambler, in general, is finding the fish and playing against them. If that means learning a new game, that’s exactly what you should do. I would highly recommend after learning PLO heading to your local casino. Those games are usually the best in the place and are typically far better than any Hold’em game in the place. Pot Limit Omaha also offers the most upside and fishiest games when it comes to playing online, as well. SportsBetting.ag is one of the most popular online poker rooms for American residents. They accept players from all 50 states and have an online casino, sportsbook, and racebook. SportsBetting.ag Poker is played on the Chico Poker Network and offers plenty of action to low to mid-stakes PLO players. Payouts are fast, and new users will receive a 100% Poker Bonus up to $1,000 on their first deposit. Ignition Poker shares their poker network with Bovada and is easily the largest online poker room available for US players. The games are anonymous, but they offer plenty of fishy action both in cash games and tournaments, including Pot Limit Omaha. Like SportsBetting.ag, payouts are extremely fast and, in most cases, free. Ignition also has the same poker bonus for new accounts, a 100% bonus up to $1,000.